WNET Channel 13 is responsible for 35% of PBS’s domestic broadcast content, including “Great Performances” and many other successful programming events such as its fundraising telethons. 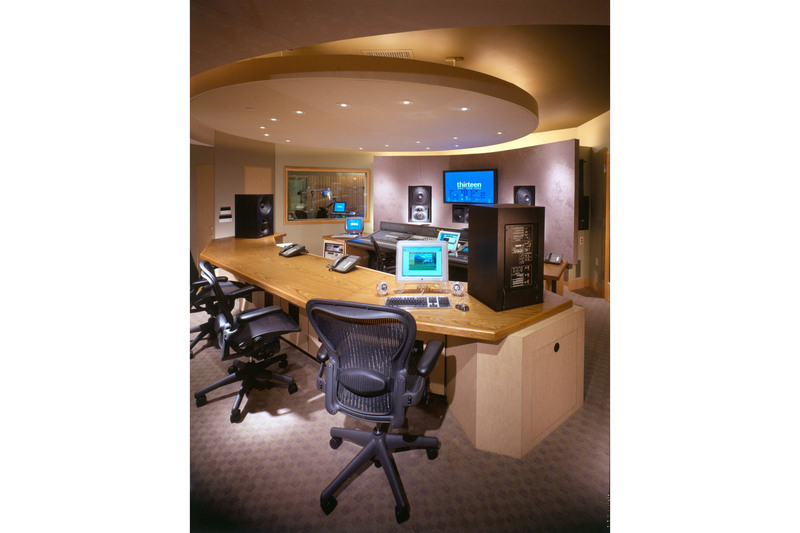 In 2000, the New York City-based public broadcaster contacted WSDG to redesign its recording, mixing and editing suites to help carry them into the next century. The suites were located on the 3rd floor of WNET’s ten-story New York City headquarters located on West 30th Street. Planning and construction had started about a year before WSDG was asked to be involved, but the audio suites had admittedly never been finished properly. Once Peter and John made the arrangement to work together with WNET, they suggested bringing in John Storyk, with whom they were both familiar. The space WSDG had been given was fixed and pre-defined: it was a square-ish room, with somewhat limited space in a much bigger building. A vocal booth already existed, but it was poorly laid out, and WNET acknowledged this fact. One of Peter and John’s key programming requirements was to create a fully capable 5.1 room with a robust and powerful monitoring system. To provide additional work space during non-5.1 projects, motorized lifts can drop rear speakers into production desk. The two also wanted the layout to be in accordance with ITU specifications, for at the time there was not widespread agreement within the technical community on how 5.1 layouts should be for post production audio and they wanted the room built to a globally recognized standard specification for audio. WNET obviously had critical requirements for video monitoring. 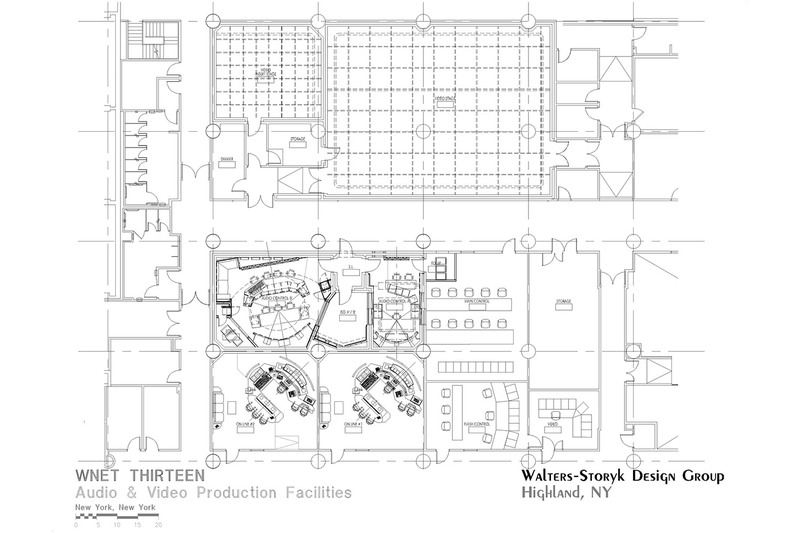 WSDG considered projection, but the limited ceiling height would not have been allowed for this. Plasma was the ultimate choice, a technology whose time was finally arriving. One of the key considerations was effective video monitoring under higher lighting levels, and under these conditions, plasma excelled. The1038c monitor is rather skinny, and fit perfectly beneath the plasma. Even though space was tight in the control room, Storyk was able to create a small seating area in the rear-right of the room. This area would be perfectly suitable for “content” listeners, or for other guests not involved in sonic judgements. The built-in couch also added to the overall comfort of the room. 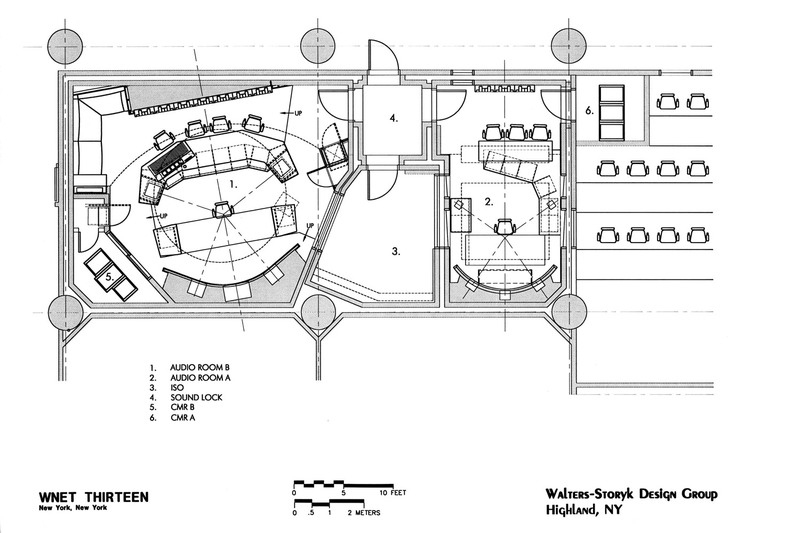 In addition to the main control area, its isolation booth and the machine room, WSDG designed a B suite. This was to be a much smaller, self contained room that could work in tandem with, or completely independent of control room A. Also, the vocal booth could be isolated for each mix area as required, or completely shared. As for the vocal booth, there were enormous isolation requirements from the outset, both above and below. All the standard acoustic isolation measures were applied: although it was acknowledged that the rooms weren’t going to be working at 120 db levels, they did have to have the ability to operate simultaneously. Studio B, the Telethon room, operated about four weeks out of the year for Channel 13’s membership drives. 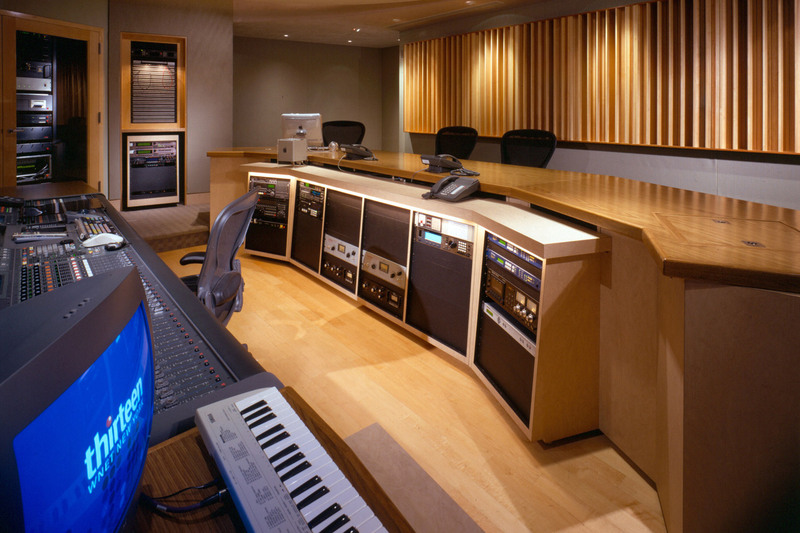 The chosen console, an AMS Neve Libra, contributed to the flexibility of the control room. Its ability to handle both live broadcast and post production work, in conjunction with a Pro Tools system, made it ideal. In fact, both control rooms are equipped with Neve Libra consoles, which are used in combination with a Pro Tools system. The live room and two 48 input soundstages are accessible to both control rooms, making it an extremely nimble environment.